that right relationship with God comes uniquely through Jesus the Christ. The Scriptures Denote That a Holy and Righteous God Will Not Accept the Unrighteous Into His Eternal Presence - In our own musing, we may wish that God would . . . think that God should . . . and conjecture that God could, but the message of the Bible confronts us with the realization that God doesn't! Only righteous persons can dwell in the presence of a righteous God. This leaves each of us in a predicament, because the Bible also reveals that "None is righteous, no, not one;"
In modern usage, righteousness is restricted to an ethical quality, conformity to the ethical norm, and the norm is relative, depending upon the standards of the community or group. In Biblical usage, the norm is the righteousness of God, not the standards of the community. Fruitless Quests for Justification - The scriptures warn against the folly of seeking justification through means which cannot bring it about. Human Wisdom - Some have listened to the message of salvation which was wrought through Christ; and they have called it irrational foolishness, rejected it as the theory of idiots. And then they have set themselves to the task of producing a better way. But God through the Scriptures warns mortals not to gamble with temporal or eternal life by putting it in the keeping of human wisdom alone. who have met God face to face and dare not pretend any longer that all their affairs are in order. who labor under no illusions that they have fulfilled their responsibilities to either God or to others. who have laid aside claims to righteousness because of good works. who hold no hopes of eternity on the basis of self-effort. Idealism and Noble Intentions - Mortals may dream of climbing the highest mountain and may sincerely feel that there is nothing to keep them from doing precisely that. But often, as they venture forth, they discover that their dreams are higher than their reach. And when they stop to look where they have been, they may note with dismay that they have but scaled the crest of a tiny hill, while the great mountain waits to be conquered. It is so with those who have tried to keep God's law perfectly! They have failed to conquer the mountain. Are there other options? Better they place their faith in the merits of Christ's righteousness, so that through him, they might stand before God, irreproachable and blameless in his sight. Any and All Self-Efforts - Whatever we may concoct as a way to merit righteousness in God's eyes . . . if it by-passes God's work through Christ's death and resurrection, it has by-passed the way to never-ending life with God. but they are justified by what God has done for them. Figure in white robe facing heaven's light - The Christian recognizes the Bible as an authoriatative voice on all matters pertaining to life and faith. Figures standing on barren earth - The Scriptures declare that a holy and righteous God will not accept a "sinful and unrepentant people" into his eternal presence. Therefore, all of humankind is faced with the possiblity of eternal separation from God as "all have sinned" and "none is righteous". Golden city - God, however, through the works of Christ, has acted to alter the situation of the sinner. In and through Christ's works, the repentant on God's earth are "justified" - made right with God. 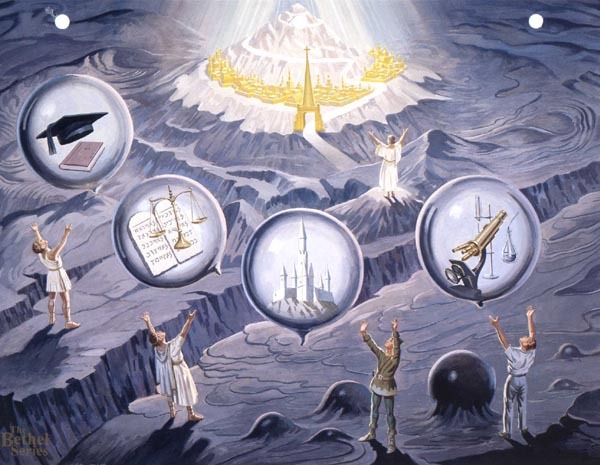 Figures reaching for bubbles rising out of barren earth - The Scriptures warn against the folly of seeking justification through means which cannot bring it about. Mortarboard and book - None are justified by human wisdom. Law tablets and scales - None are justified by works of the law or morality. Ivory tower - None are justified by idealism and noble intentions. Microscope and vials - None are justified by self-efforts. Bubbles reflect heaven's light - Human wisdom, works of the law, morality, idealism, noble intentions, and self-efforts are all commendable in their place, but each is powerless to bring about justification. Pathway descending from mountaintop - The people of God are justified by what God has done for them through Christ. Figure in white robe extends arms heavenward - Justification is appropriated through faith.